Taking a journey through the extensive space involves skirting the edge of Daylight Flotsam, venturing across a courtyard between two wardrobes with mirrors on their doors, past the outline of a shed drawn in three dimensions using fluorescent tubes and reaching a doorway overlooking the canal at the back of the building in which Culbert has placed jars of water. Visiting Venice in November, the season of the aqua alta (the high tides that flood parts of the city for hours at a time), is not without its inconveniences. After weeks of neurotically checking the tide forecasts and pondering the advisability of finding space in my bag for welly boots (I took them and put them to good use), I found Level quietly intriguing. 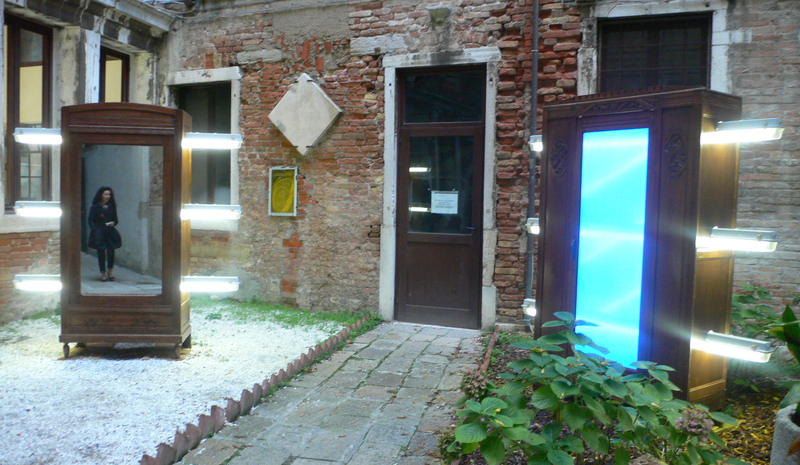 Having visited by chance, I found Front Door Out Back an enjoyable and really interesting exhibition. 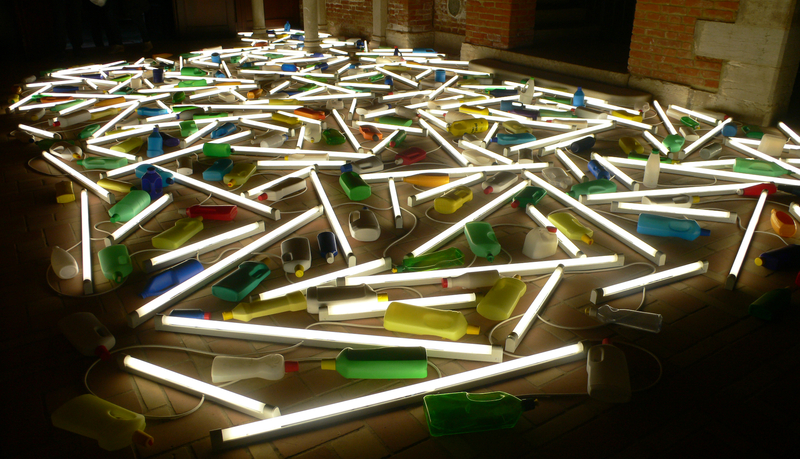 Light-based work has been the subject of some major, and very successful, shows recently – Light Show at the Hayward Gallery (which included a work by Culbert) attracted huge crowds, as did Dynamo at the Grand Palais in Paris – so Bill Culbert was timely choice to represent New Zealand. 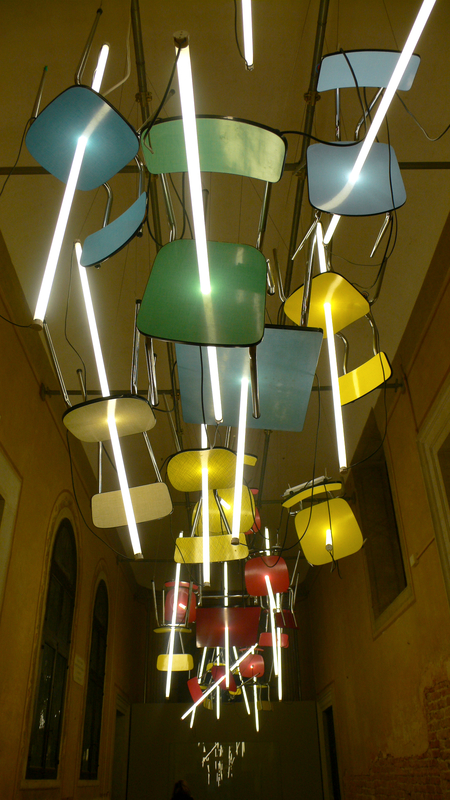 Use of light was only part of the story though: for me, the success of the work, and of the exhibition, was more about the use of everyday artefacts. Mundane objects have escaped their natural habitat and joined forces with the light that is Culbert’s signature material; it’s a curious alliance and some of the works are disconcerting in their strangeness. All in all, I liked this exhibition a lot and I loved the journey it took me on through the space. Very Venice. 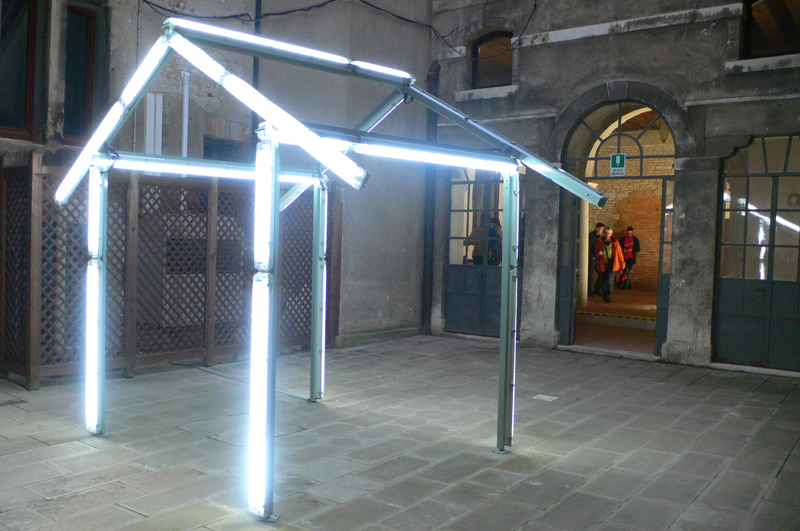 This entry was posted in Assemblage, Installation, Light, Sculpture and tagged art, Bebop, Bill Culbert, Front Door Out Back, New Zealand, Venice, Venice Biennale by Ann Jones. Bookmark the permalink.